Making a donation to Underground will help us enormously. We are registered for Gift Aid so we can maximise any donation made to us. You can set up a standing order to Underground by logging in to your online banking or by popping into your local branch. Please fill in and return the Standing Order form to Underground so that we know what you have donated and so that we can claim gift aid. Please contact us to receive this form via email. Thank you! Easy fundraising wont cost you a penny! Earn donations for Underground as you whop online. You can also support us by signing up to Easyfundraising. 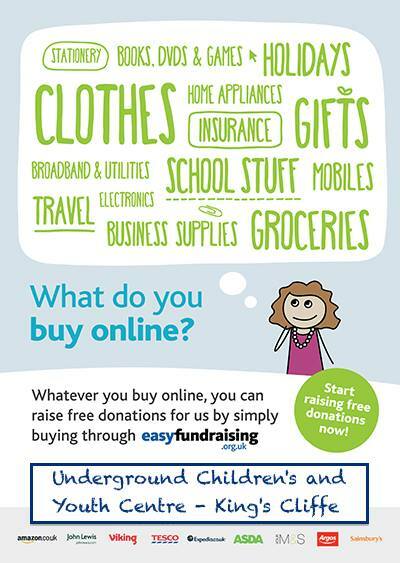 Log on to http://www.easyfundraising.org.uk and choose Underground Children’s and Youth Centre as your cause to support. Could you organise an event on our behalf? Doing something amazing – a run maybe or a skydive? Why not ask for sponsorship!